How do we process your personal data? Why do we process personal data? At Canterbury Oast Trust (COT) and our operating subsidiary The South of England Rare Breeds Centre (RBC) protecting your privacy and your personal data is very important. We will comply with all aspects of the Data Protection Act 2018 and the General Data Protection Regulation 2016/679 (GDPR). COT is the data controller (contact details below) so we decide how your data is processed and for what purpose. We want you to know that will never sell, rent or trade your personal information with anyone. In this Privacy Statement we let you know when and why we collect your personal information, how we use it, the limited conditions when we may disclose it to others and how we keep it secure. You can browse both the Canterbury Oast Trust (COT) and South of England Rare Breeds Centre websites at www.c-o-t.org.uk and www.rarebreeds.org.uk without disclosing any personal information. If you wish to buy tickets, become a member, volunteer or take part in some other activities you will be asked to provide certain personal information. See page 2 to this document for our Cookie statement. Canterbury Oast Trust complies with its legal obligations under GDPR by keeping personal data up to date; by storing and destroying it securely; by not collecting or retaining excess amounts of data; by protecting personal data from loss, misuse, unauthorised access and disclosure and by ensuring appropriate technical measures are in place to protect personal data.  To allow us to keep people up to date with our business activity. 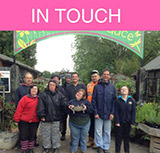  To run Learning Skills programme for the benefit of adults with learning disabilities.  To run the South England Rare Breeds Centre Tourist attraction and associated events.  COT and the RBC use a third party provider to administer and parts of our website and the ticketing process. We enter into a contract with our provider (and other third party providers in other areas of our business) and require these parties to confirm GDPR compliance.  COT may hold information provided by a third party, for example the next of kin for a person in our care. As part of the registration process for our e-newsletter, In Touch, we collect personal information. We use a third-party provider, Mail Chimp, to deliver our newsletter. We gather statistics around email opening and clicks using industry standard technologies to help us monitor and improve our e- newsletter. For more information, please see Mail Chimp’s privacy notice mailchimp.com/legal/privacy. You can unsubscribe to general mailings at any time of the day or night by clicking the unsubscribe link at the bottom of any of our emails or by emailing [email protected] and your request will be passed to the right person here. You can also call our switchboard number on 01233 861493 and ask to unsubscribe from our data bases. When you purchase a ticket(s), merchandise, membership or gift voucher(s) through the COT or Rare Breeds Centre website or ticketing system your name, address, email and contact number will be stored in our Website Vision ticketing system. You may, of course, purchase a ticket (or tickets) in person without supplying the aforementioned personal data. Please be assured that we do not share, sell or exchange your personal details with any other Company.  To fulfil ticket, merchandise, gift vouchers and donation requests and process payments.  To ensure you receive the best possible customer service and to help us with internal administration. This might include contacting you with important information relating to your booking or purchase.  We will send you updates via email about what’s on, offers and news or about supporting us.  We might email you, or telephone you about a specific topic you’ve requested to hear more about.  We will use information to help us target our marketing communications so that they’re more relevant to you.  We will analyse information from customers and supporters to continually improve the services we offer including our Rare Breeds Centre events, our website and our other products.  We might use information to help us run the test version of our website that we use internally to pilot new features and ensure the smooth running of our web services.  We might use your information to keep our database accurate and relevant.  We use CCTV recording equipment in and around our premises for monitoring and security purposes.  We use information to detect and reduce fraud and credit risk.  We may process any of your personal data identified here where necessary for the exercise of or defense of legal claims, in an administrative out-of-court process or in court proceedings, and where necessary for obtaining or maintaining insurance coverage, managing risks or obtaining professional advice. appropriate proof of your identity. Email your request to info [email protected] .  Marketing data - including events and membership data, - will be retained for a maximum period of 6 years.  Data held by our appointed internet provider – Website Vision – will be held for 7 years.  Fundraising data will be retained for 3 years.  Care data – Records relating to people in the care of COT will be retained for the entire time a person is supported by the Trust. At the end of contracted, care records will be kept for the current year plus 9 years to comply with contractual and legal obligations.  Care data – not relating to people in the care of COT - will be retained for 3 years. end of employment or volunteer activity, records will be retained for current year plus 7.  HR department – Data relating to persons applying for employment but not subsequently employed (paid or volunteer) will be retained for 6 months.  HR department – uses a third party provider, to assist recruitment. Encrypted data is held on their secure servers in accordance with this provider’s terms and conditions. These terms and conditions are made available for all applicants before consenting to submit their data via the third party provider.  Finance data – will be retained to the end of the current financial year plus 9 years. Your personal data will be treated in strictest confidence and will be shared only with third parties for necessary administration and maintenance and for legal and auditing purposes. Unless legally obliged to, we will only share your data with third parties with your consent. All and any amendments or updates will be immediately effective upon notice, which we may give by any means, including a posting or other notice on our website(s).